Facilities: FCI Herlong with an adjacent minimum security satellite prison camp. 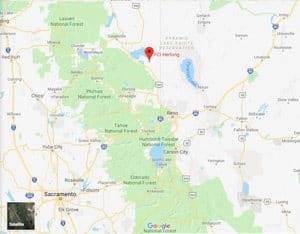 Location: FCI Herlong is located in the Sierra highlands of northern California, 50 miles northwest of Reno, Nevada and about 30 miles south of Susanville, California. Medical Care Level: Level 1. See our page on Medical Care Levels and Procedures for more information. Background: FCI Herlong opened in 2007. The facility includes a satellite prison camp that houses minimum security male offenders. Notable inmates include Earth Liberation Front member Tre Arrow (served 5 years for arson) and co-founder of environment group Peaceful Uprising Tim DeChristopher (served 2 years for false representation). Housing: Inmates are housed in cells. In the camp they are housed in dormitories. Health Services: FCI Herlong provides routine medical care for inmates. This care includes intake examinations, emergency care, and sick calls. While emergency care is available 24 hours a day, inmates must submit a triage form to be evaluated for non-emergency care. Psychology Services: FCI Herlong offers crisis counseling, individual and group therapy, and medication treatment in conjunction with Health Services. Typical treatment groups include anger management, and AIDS/HIV Awareness. Residential Drug Abuse Program (RDAP): FCI Herlong houses a Residential Drug Abuse Program (RDAP). The Drug Education class, the Non-Residential Drug Abuse Program (NR-DAP), and Alcoholics Anonymous (AA) are also available. Education Services: FCI Herlong offers inmates GED and English-as-a-Second Language (ESL) programs. Adult Continuing Education (ACE) and parenting programs are available to the inmate population. High school diplomas and college correspondence courses are also available, but inmates must pay for them. Advanced Occupational Education: FCI Herlong does not offer any advanced occupational education programs. Vocational Training: The FCI Herlong camp has many vocational training programs which enable inmates to work outside the camp in the local community. Apprenticeship: FCI Herlong does not offer any apprenticeship programs. Library Services: Leisure and law libraries are available to the inmate population. In the leisure library inmates can check out fiction and nonfiction books, newspapers, and magazines. The law library primarily consists of the TRULINCS Electronic Law Library. Inmates also have access to typewriters and a copy machine. UNICOR: The FCI Herlong UNICOR facility handles fleet management and vehicular components. Commissary: Inmates are allowed to spend up to $360.00 per month in the commissary. They can shop once a week on their designated shopping day. Copy cards, postage stamps, and over-the-counter medications do not count against this spending limit. Recreation Services: FCI Herlong’s Recreation Department offers both indoor and outdoor activities. Indoors, inmates can engage in artwork and hobbycraft projects. Outdoors, inmates can walk the track, engage in individual or group exercises, or play team sports.